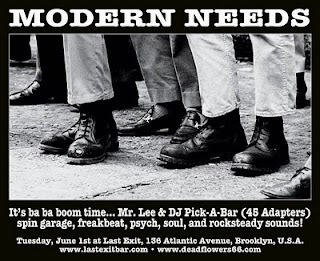 Dead Flowers Productions: Modern Needs: Rough And Tough! Modern Needs: Rough And Tough! The June edition of the monthly Modern Needs party features special guest DJ Pick-A-Bar of 45 Adapters/SPQR fame... Pick-A-Bar and Dead Flowers' own Mr. Lee will be spinning only the finest in 1960s rock, psych, soul, ska, and rocksteady wax!